HF: This is an article where we can gradually add information about the fishing industry, the production of food and beverages, and tobacco products in Hong Kong during World War 2. As bits and pieces come in I’ll update the article and re-post it with the current date. HF “Several Japanese fishing firms had established themselves in the colony since the mid-1920s and others had moved in after the conquest in the wake of the Imperial Navy. 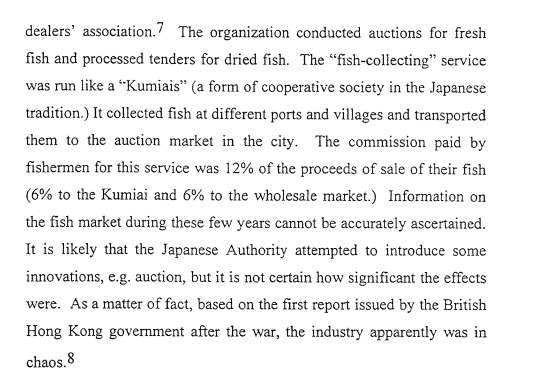 These firms were soon trawling for fish for Hong Kong’s consumption as far afield as Vietnam. In the meantime they set to work galvanizing the local fishing communities. They dispensed fishing tackle and fitted the local wooden junks with engines torn out of commandeered British cars; and they also endeavoured to pass on on to the still primitive operators of Shaukeiwan and Cheung Chau their own more sophisticated fishing techniques. The firm closed operations during the Japnese occupation. BE: [ The Lane Crawford Bakery] was still used as a bakery in June 1942 as my father was offered his old job as manager! This would obviously not have been a positive development, and he succeeed in avoiding the offer and continuing his work baking bread for the hospitals. Later in the war the bakery was shut and the building used to make military buttons, rattan baskets and salted fish. This presented a huge restoration problem after the war, but the work was done – the facts that the press carry complaints about bread and note a thriving black market in December 1945 and that my father didn’t go on home leave until July 1946 (later than anyone else I’m aware of) suggest that it was a long time before the bakery was fully functional again. As far as I know it was still in operation when he left to work for the Garden Company some time in 1947/48. Japanese authority in Hong Kong lasted until August 1945, when, after the atomic bombings of Hiroshima and Nakasaki, Japan agreed to end the war on the Allies’ terms. YL Hing Ah’s factory was originally located in Mongkok but moved to Kowloon City (where many of the sauce factories were located as discussed in the Five Treasures article) until the Japanese occupation when they were forced to relocate to To Kwa Wan as part of the airport extension project. After the War, Hing Ah relocated to a 35000 sq ft site at KIL 2812, Wing Hong Street and Castle Peak Road which could dry up to 1500 trays of preserved fruits at the same time. YL During the Japanese occupation, Lee Wah Mui incurred hundreds of thousands of dollars of damages as its machines were destroyed and raw materials and finished products were looted. The business resumed after the War with 40 workers (10 male, 30 female) but business volume was only a tenth of what it was before the War and raw materials were hard to come by as the Civil War in China affected supply and the Tsuen Wan orchard was destroyed during the Japanese occupation. YL During the Japanese occupation, Cheung Kat-shing was stranded in HK and served as chief evangelist for the HK Christian Association, a group created by the Japanese military government to supervise Church activities in occupied Hong Kong. Business recovered quickly after the War and in 1946, the firm reported profits of HK$1.1 million (華僑日報, 1947-07-30) which dropped to $676,220 in 1947 (華僑日報, 1948-03-11). YL During the Japanese occupation, production and export business was suspended at Oriental and the business scraped by through selling remaining inventory to the local population and started to build a local following. Since the Oriental plant was on the Japanese invasion route during the Battle of Hong Kong, the plant suffered damage but fortunately most of its equipment was intact so it managed to resume production relatively quickly after the War under the leadership of Chong and deputy manager ST Wu (伍舜德, better known as founder of the Maxim’s group of restaurants later on; working for Oriental as a representative of the Luk Hoi Tong group). YL During the Japanese occupation, business environment was tough in general but as pickles was a food staples for middle to low income population, Yam Hop Hing did relatively well. After the War, the Yau brothers entered the preserved fruit business with the help of a Cantonese preserved fruit expert and formed the Yam Hop Hing Preserved Fruit Factory with factory located in Ha Kwai Chung (Lower Kwai Chung). Business took off and Yam Hop Hing preserved fruit was sold throughout Southeast Asia. Its Lion brand of canned goods included a wide variety of food ranging from fruits such as longan, lychee, pears and pineapples to vegetables such as water chestnut, lotus, bitter melon, green beans and chestnut to fish such as grass carp (wan yu) and various Cantonese salted fish which were sold domestically and exported to the US and Southeast Asia. Business was strong during the War as supplies of fresh food was scarce. Yok Shan Machine Bakery (玉山机制饼, removing the last name Mar) – it closed for 8 years during the Sino-Japanese War but re-opened afterwards and was absorbed into Lingnan Biscuit Factory (岭南饼干食品厂)in 1953. HF: Severe damage during the Second World War left only the refinery building proper standing. By 1950, the entire Refinery had been rebuilt. YL A native of Dongguan, D.T. Wong came from a family of farmers and in fact his father Wong Fook-kwai (黃福貴) operated a farm in Kowloon by the name of Fook Kwai Yuen when he joined him in HK after 1949. Wong left his native Dongguan at the age of 12 in the 1920s for Canton where he started working as an apprentice at a noodle shop. He came to HK before the War and realizing the potential of mass produced noodles, he founded Tin Kee in 1942 under Japanese occupation. By 1947, he was the leader of the industry and led the formation of HK Kowloon Noodle Manufacturers Association (港九粉麫製造業總會) with himself as the chairman. YL By the Japanese occupation (1941-45), Wong Yuk-cheung’s son Wong Hing-kui (王慶渠) had taken over and in 1943, Wong Wing Kee added a branch in its own property at 39 Gilman’s Bazaar in Central. YL In 1938, the Japanese occupied Canton and the Yan Chim Kee store there was looted. During the Japanese occupation of HK, Yan Chim Kee’s production was significantly reduced and in the early years after the War business was challenging even with contracts from the government to manufacture a variety of candies. Mike T: The Orient Tobacco Manufactury Company is mentioned in the Chamber of Commerce Members list from 1936 (page xxxiii), showing Orient Tobacco Manufactory / C. Ingehnohl Ltd. as a member since 1912. This article was first posted on 16th June 2015.